The United States is very popular when it comes to the issue of lottery games. Many lottery game lovers are well aware of the mammoth amount that some American lottery games provide. The most popular lottery game which boasts of jackpot amounts that can go well into hundreds of millions of dollars is the U.S. Powerball lottery. The Powerball is an international lottery available to players worldwide. Other American lotteries exist that are exclusive to a particular geographical location. An example of such a lottery game is the New Jersey Cash 4 Life. The Cash 4 Life lottery game was started in June 2014. Currently offered in Georgia, Maryland, New Jersey, Tennessee, Indiana, New York, Pennsylvania, Virginia and Florida with other states like Ohio showing an interest in joining, the Cash 4 Life as the name suggests is a lottery game that gives players the chance to receive cash everyday for the rest of their lives. The Cash 4 Life lottery follows a 5/60 + 1/4 matrix, similar to that of the US Powerball. With this system of play, each player is expected to choose 6 numbers shared as follows: The first five numbers are chosen from a number field of 60 while the sixth number is chosen from a separate number field made up of 4 numbers. The number chosen from the 4-number field is referred to as the Cash Ball. To play the Cash4Life, simply go to any authorized retailer and request for a Cash4Life slip. On the slip, pick your five main numbers from the 60-number field and your Cash Ball from the 4-number field. You can choose to pick the numbers manually or opt for a Quick Pick. A Quick Pick authorizes the system to randomly generate and pick numbers on behalf of the player. This method is great especially for first-time players or players in a hurry to catch up with a particular draw. To play via the Quick Pick option, simply check the Quick Pick box on the Cash4Life selection slip. In addition, players who wish to double their prize amounts (with the exception of the first and second prizes which are referred to as “For Life” prizes can play the DOUBLER Option. 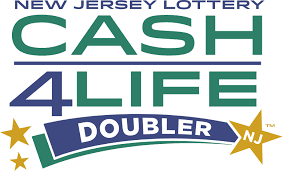 The Cash4Life bet slip can be purchased at any New Jersey Lottery Retailer. Mark the checkbox next to the DOUBLER option to double your non-4life cash prizes. Playing the DOUBLER option allows for an additional play of $1 per draw. Players are also expected to choose the method of payment they prefer for the first and second prizes, also known as For-Life (4-Life) prizes. These prize tiers offer payment in one of two forms – Annuitized payment of $1000 per day for the First prize and $1000 per week for the second prize for the rest of your life, or the Cash lumpsum payment option. Note that it is possible to change from the Annuitized form of payment to the Cash lump sum form of payment if you win. However, it is not possible to change from the Cash lump sum to the Annuitized form of payment. Players can also choose to play their selected numbers for a maximum of ten future draws. This prevents players from forgetting to participate in future draws as the selected numbers are automatically entered into every future draw for as many consecutive draws as selected. Once all play options have been selected, simply give your selection slip back to the retailer for the Cash4Life ticket to be printed. The ticket also acts as the receipt and carries the numbers which the player has selected as well as the dollar value of the ticket. It is important to verify the information on the ticket before signing on the back of the ticket in order to avoid theft. Each Cash4Life play costs $2 while each Cash4Life Doubler costs $1 per play. It is important to handle the lottery ticket with caution in order to avoid damaging the ticket’s barcode as this can delay the validation and payout of a winning ticket. The Cash4Life winning numbers are drawn twice weekly. These draws take place on Mondays and Thursdays in Lawrenceville, New Jersey at 9:00 PM. Sale of tickets close every Monday and Thursday 15 minutes before the beginning of the draw. During the draw, six numbers are drawn – five from a pool of 60 balls and the Cash Ball from a pool of 4 balls. The first prize or jackpot is won by matching all the six numbers drawn. 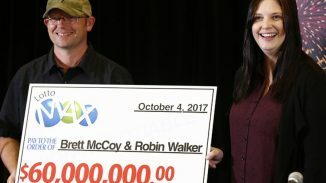 The Cash4Life jackpot as has been mentioned above can be paid out either as a cash lump sum of $7 million or an annuitized payment of $1000 every day for the rest of the winner’s life. The second prize which can either be an annuitized payment of $1000 per week for the rest of your life or a lump sum amount of $1 million is won by matching all the five main numbers with exception of the Cash Ball. The odds of winning the first and second Cash4Life prizes stand at 1 in 21,846,048 and 1 in 7,282,016 respectively. If more than one player wins any of these prizes, the amount is shared among the winners equally. In essence, if two players match all six numbers, each of them will receive $500 daily for the rest of their lives. Alternatively, they can opt for a cash lump sum. Other prizes exist for players who match 2 to 4 of the main balls with or without the Cash Ball. Prizes also exist for players who are able to match just a single main ball in addition to the Cash Ball. The odds of winning any prize in the Cash4Life lottery stands at 1 in just 8. Because the Cash4Life is a multi-jurisdictional lottery game, the procedure for claiming prizes differ from state to state. It is therefore important for players to familiarize themselves with the rules relating to the winning of Cash4Life prizes in their own state. In theory, the Cash4Life lottery is currently not available to international players but with the presence of the internet, nothing is never really restricted, especially when it comes to lottery games.